At DHI, hair transplantation is a completely safe and painless procedure performed only by experienced physicians to ensure perfect results every time. Thanks to our recent innovations, we’ve been able to take it one step further and no longer require that the patient shaves his head, like with FUE and FUT- Strip. We have seen an increasing number of clinics, both here in Greece and abroad, try to replicate this innovation and advertise the ability to do an Unshaven session without having the appropriate knowledge or experience required to produce the expected results. Many of these clinics will claim to offer an Unshaven session but the client will soon discover this is only a partial truth. In most cases, they will do shave only the donor area of the patient and allow the rest of the hair to remain as is. At DHI, we see this is as intentionally misleading and do not consider this an Unshaven session. 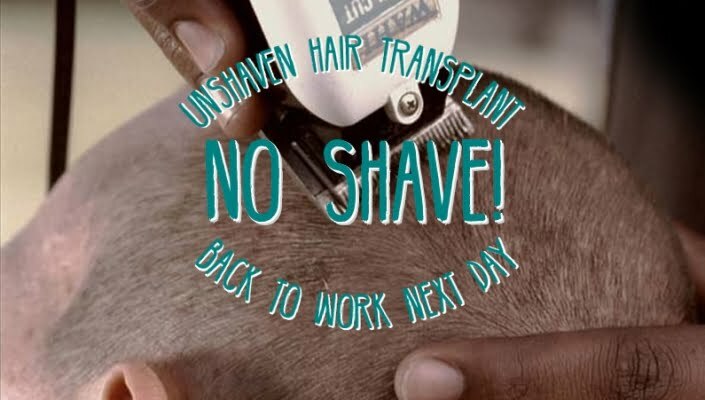 In all of our DHI centers, the patient who proceeds with hair transplantation in an Unshaven session is assured there will be absolutely no shaving or clipping of a single hair, regardless of the length. This means you can return to work and normal activities the very next day after the session without any visible change to your appearance. With the Unshaven technique, any sign of the hair transplantation is not visible at all because it is covered by the pre-existing hair. As with the classic DHI Direct Hair Implantation, healthy hair follicles from the back of the head – an area not usually affected by hair loss – are extracted and implanted individually. Using the special patented DHI implanter, each hair follicle is placed in a specific direction, depth, and angle to achieve 100% natural results and maximum viability every time. The implanted follicles will continue to grow for a lifetime after implantation as they are genetically programmed not to fall out.